Eczema,is a reaction to an external or internal allergen stimulus. There are listed, according to the Eczema Association at least eight various kinds of eczema, and each type of eczema warrants a different healing option. Eczema is a skin condition caused by inflammation. When diagnosed with eczema, it is important to keep your symptoms under control. Knowing what triggers your outbreaks are vital so that you can prevent them. Some common triggers are stress, allergens, irritants, and dry skin. Establish a Daily Skin Care Routine – This is sometimes in conjunction with prescription therapy. Try not to miss any treatments so that your eczema doesn’t flare. Be Aware of your Stressors – Avoid as many stressful situations that you can, and learn stress management techniques to help you with the ones you can’t. You can learn these techniques from a doctor or psychologist. Try Not to Scratch or Rub your Skin – Be aware of what materials or substances that irritate your skin and avoid them. Avoid itchy fabrics, like wool, and dress in soft, breathable clothing. OTC Products – These are medications and products that you can buy without a prescription. They include mineral oil, tar-based products, petroleum jelly, and gentle cleansers that do not contain soap. These treatments moisturize, treat symptoms of itching, and gently cleanse your skin to avoid infection. Prescription Medications – Your doctor can prescribe systemic oral drugs, topical calcineurin inhibitors (TCIs), and topical corticosteroids. Bathing – This is one of the most effective ways to treat your dry skin. Soaking in a warm bath is very therapeutic. You can add one of the following items to your bath water to treat your specific symptoms: baking soda, oatmeal, salt, vinegar, or bleach. Gently pat your skin dry with a soft towel and moisturize immediately afterward. Moisturizing – If your skin gets too dry, your symptoms can flare. Washing without moisturizing afterward, harsh soaps, cold temperatures, low humidity, and even wind can dry out your skin. Phototherapy – A special machine is used that emits ultraviolet B (UVB) light onto your skin. This increases bacteria-fighting systems in the skin, increases vitamin D production, and reduces inflammation and itching. Alternative Therapies – Stress reduction techniques, supplements, acupuncture, plant-based topicals like coconut oils, biofeedback, and meditation have all been shown to reduce your symptoms. 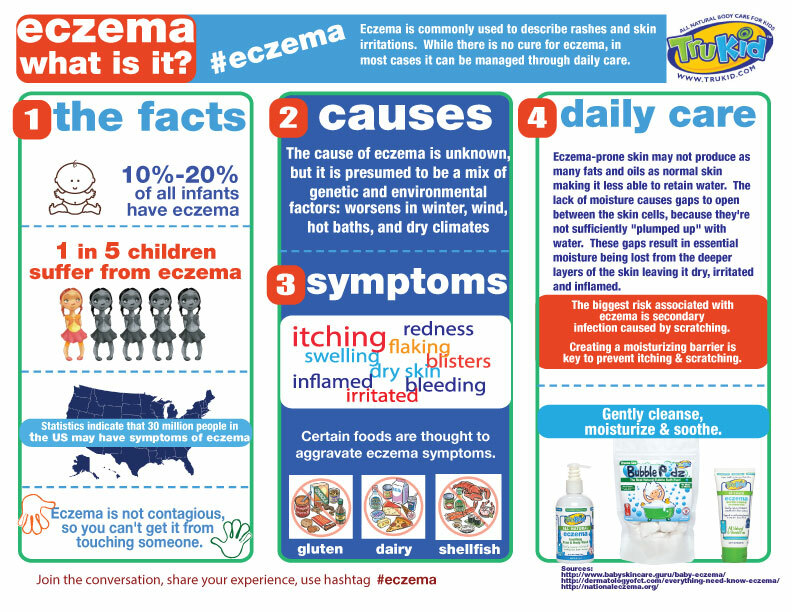 Remember, symptoms of eczema are different for everyone and not everyone will respond to the same type of treatments. It is best to familiarize yourself with all available options and discuss them with your doctor, so you can customize a plan that works best for you. Have you ever noticed itchy red patches of skin on your child’s hands or face, or maybe noticed the same irritation on your elbows, neck, hands or knees? If so, the skin irritation you are seeing could be the result of eczema. Eczema is a category of medical conditions that cause inflammation and irritation of the skin. Symptoms of eczema can include, dryness, itchy skin, redness or rash, scaly or thickened areas of skin. This type of eczema occurs when you come into contact with an allergens or irritants, such as solvents, detergents, paints, bleach, smoke, or fumes. Most often it is found on the hand or other body part that touches the irritant and can causes redness, burning, and itching. As the name suggests, this condition is usually found on the hand and is caused by a combination of genetics and exposures to irritants. It is one of the most common types of eczema and it can cause pain, dryness, blisters, cracking, and redness on the hand. This type of eczema is a chronic condition that develops typically in children starting as young as six months old. With this type you may often experience flare ups as well as periods with no symptoms. While the exact cause is unknown, atopic eczema comes about when your immune system goes into overdrive. Neurodermatitis is characterized by itching, discoloration, and thick areas of skin that are often the result of rubbing and scratching the affected area too much. If you suffer from this form of eczema you may notice these scaly patches of skin on your neck shoulders, feet, wrists, and scalp. Exposure to nickel, chromium salts, or cobalt can cause dyshidrotic eczema. You can also have this brought about by stress or allergies. This type of eczema is characterized by small and itchy blisters on the edges and soles of the feet and tips of the fingers. You can suffer from this type at any age and it usually occurs from either dry skin in the winter, insect bites, or skin inflammation. Like the other types, you may notice dry skin and itching, but this type is most identifiable by its round spots or open sores. This type of skin condition occurs due to changes in the pressure of the blood flow in your veins. Too much pressure in your veins can cause the blood to leak out into the skin causing scaling, swelling, redness, pain, itching, and in severe cases can lead to infection. If you have symptoms of eczema, determining the type you have is important for you to receive the best possible treatment. Treatments can range from ointments, to simply avoiding irritants, and even chronic conditions can be well controlled if properly treated. If you have skin irritation, or other symptoms of eczema, contact your doctor today to determine your best course of treatment.